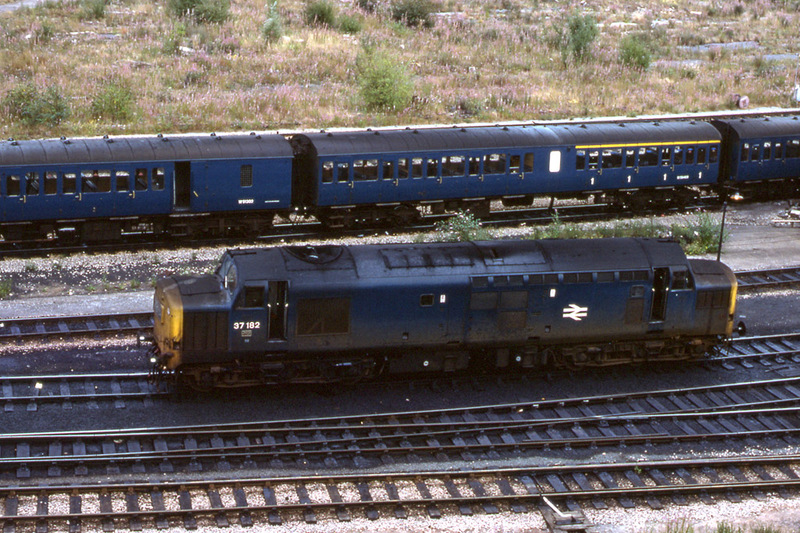 Three hundred and eight (308) diesel electric locomotives of class 37 were built by English Electric & Co Ltd from 1961. The locomotives were powered by English Electric 12 cylinder type 12CSVT engines and had a maximum tractive effort of 55,500lbs. 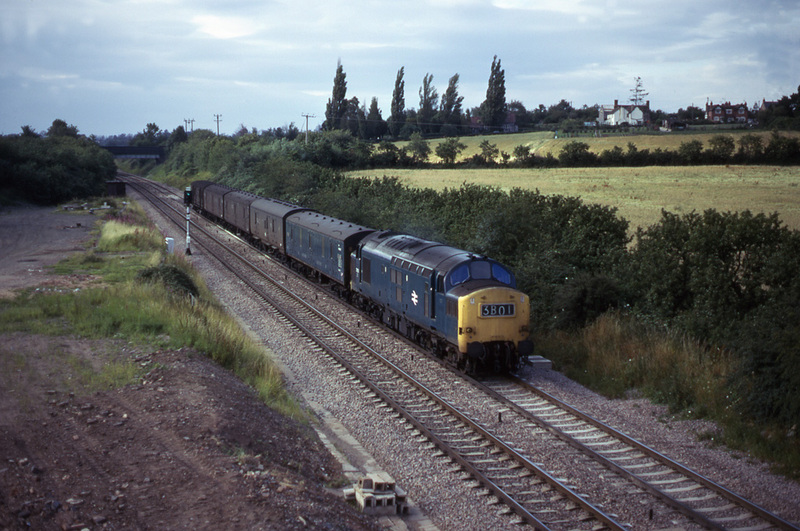 Class 37 diesel locomotive No.37158 was in charge of a southbound parcels train when passing the site of Defford Station on 25th July 1974. Photograph taken by Andrew Smith. 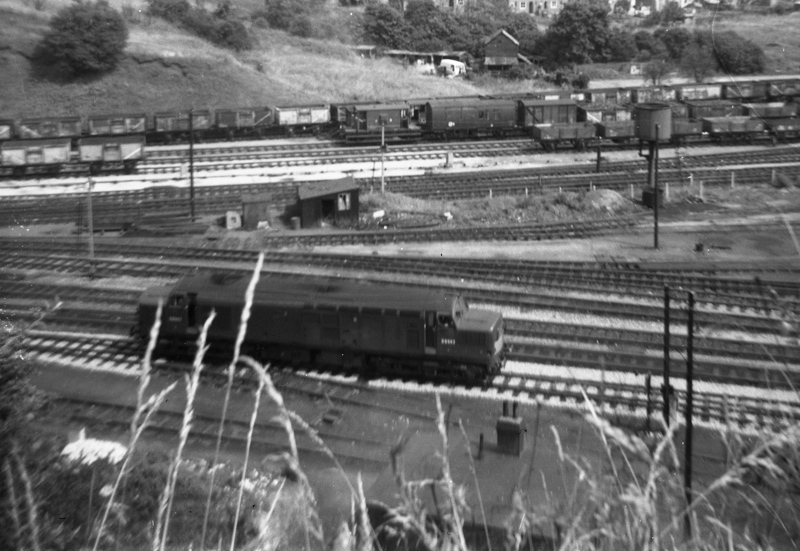 In July 1975 class 37 diesel locomotive No.37182 in Rail Blue livery was in the shed yard at Worcester. Behind the class 37, also in blue livery, is the first of the Birmingham Railway Carriage & Wagon Co Ltd class 118 three-car diesel multiple units (car No.51302, 59469 and 51317). (This photograph moved from elsewhere on the site). Photograph taken by Andrew Smith. 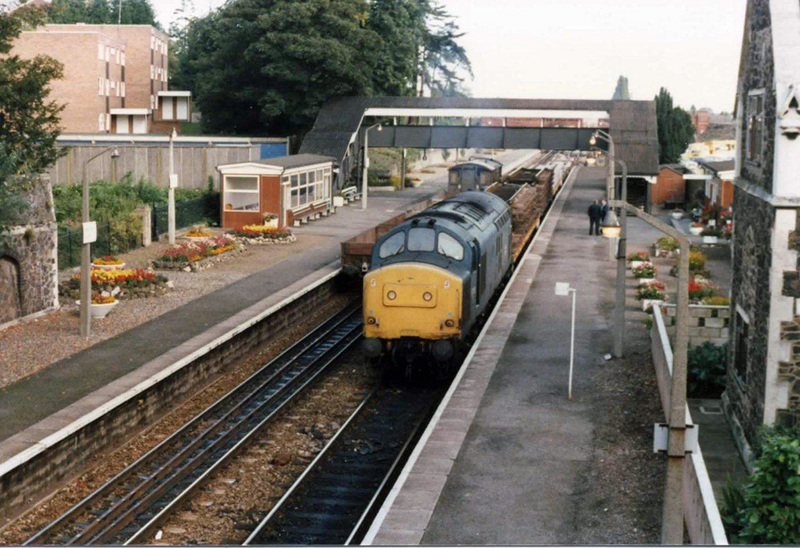 Class 37 diesel locomotive No.37278 made a rare appearance for the class when it worked an engineering train to Malvern Link Station in 1985. Although shorn of most of its buildings the station still had a well-kept appearance as evidenced by the flowers on both platforms. Photograph taken by Richard Atkinson. 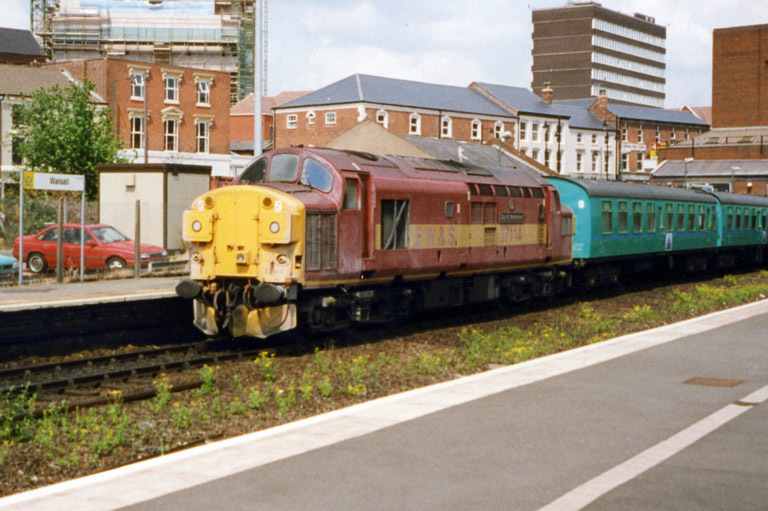 Class 37 locomotive No.37114 seen here at Walsall on 7th July 1998 was named 'City of Worcester' at the Worcester Open Day on 2nd May 1993. 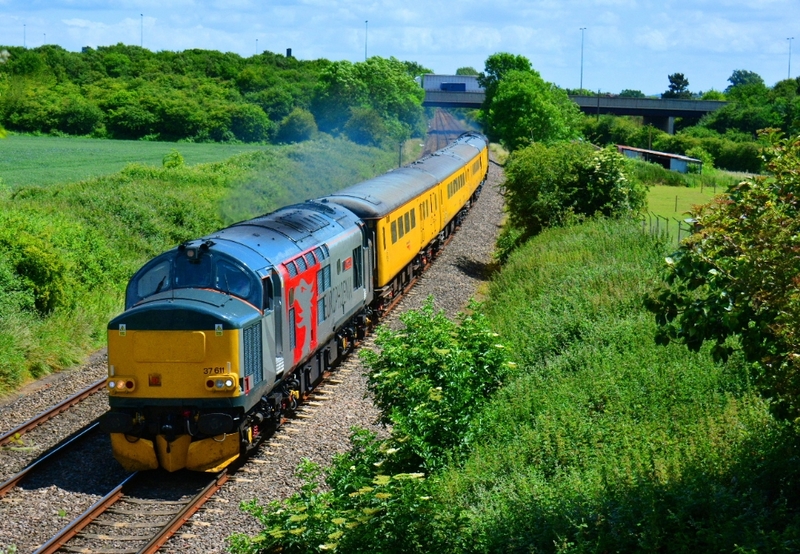 Class 37 diesel locomotives Nos.37688 & 37057 in different versions of the Direct Rail Services livery pass Abbotswood with a northbound waste train from Berkeley to Crewe on 17th May 2011. Photograph taken by Andrew Smith. Class 37 diesel locomotives Nos.37608 and 37611 worked from Bristol to Tyseley on 15th June 2017. 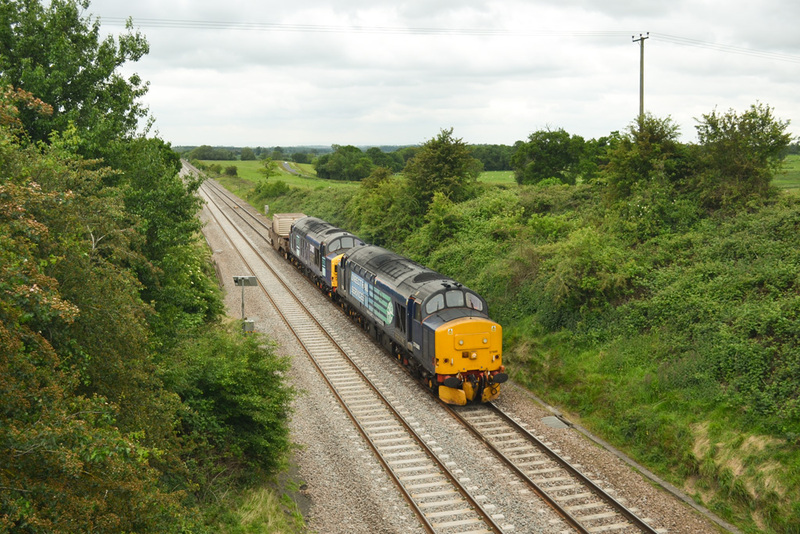 Steve Widdowson took this view of the pair at Norton, near Worcester.